Canon's latest high speed scanner, the imageFORMULA DR-C125W, is its first desktop scanner to incorporate Wi-Fi and designed to connect to any desktop or portable device. It also boasts a small footprint and a maximum throughput of 25 pages per minute. 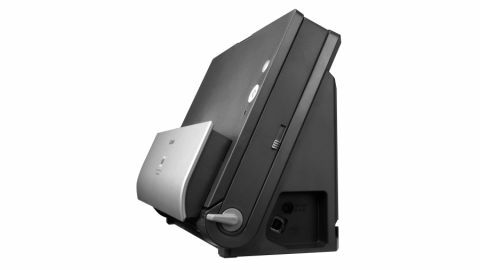 One of the main problems with the traditional desktop scanner these days is that not many businesses exclusively use a desktop. Most have a selection of devices from laptops to smartphones to tablets, and not all of the devices have operating systems designed with peripherals in mind. The imageFORMULA DR-C125W gets around this by creating its own scanning hotspot, to allow any Wi-Fi enabled device to connect and use it. Alternatively, the Wi-Fi can be switched to connect the scanner directly to the business's wireless network so it can be shared by multiple devices in a small workgroup. Unfortunately, the theory behind the Wi-Fi connectivity is a lot better than reality. Recognising the scanner on our test laptop was not a trivial process and needed far too many visits to the manual to work out which buttons needed pressing. We managed to get the scanner to successfully connect directly to a laptop using an 'AP mode' connection, but had significant problems getting it to work in 'station mode' so it could be used as a shared network device. Luckily, the scanner also includes a standard USB port so it can be used as a dedicated standalone unit if required, and we were able to connect first time using this method. The imageFORMULA DR-C125W is Canon's first generation scanner with built-in Wi-Fi functionality and inherits many of the features from the imageFORMULA DR-C125: it takes up the minimum amount of space possible - just 300(w)x220(h)x156(d)mm when in the most compact path mode - and features a J-shaped paper path to minimise the footprint required. It ejects the paper into the vertical paper slot at the front. In straight path mode it takes up slightly more space, 300(w)x339(h)x235(d)mm, and it simply throws out the scanned images into a pile in front of the scanner. The J-shaped path also restricts the thicknesss of the paper that can be scanned: in compact mode the limit is 128gsm paper; in straight path mode the maximum thickness is 209gsm. Another consequence of the small form factor is that the sheet feeder is limited to just 30 pages of ordinary paper, which means that when printing longer reports someone has to be on hand to add pages while it's in progress.